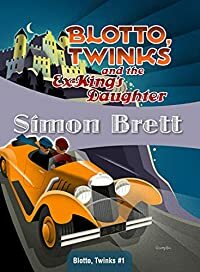 Blotto, Twinks, and the Ex-King's Daughter by Simon Brett, a Mysterious Review. Review: The Dowager Duchess of Tawcester is hosting a weekend hunting party at her country estate for a group that includes the ex-royals of Mitteleuropa when a body is found in the library — a most inconvenient interruption to her social obligations — in Blotto, Twinks, and the Ex-King's Daughter, the first mystery in this series by Simon Brett. The local police are represented by one Chief Inspector Trumbull, who "had not been at the front of the queue when the intellect was handed out. Indeed, he appeared not to have been in the same county." He insists on speaking to the assembled guests, but the Dowager Duchess is having none of it. Reasoning that the murderer — if, in point of fact, he is among her guests, which she considers highly unlikely — isn't apt to announce that he did the deed, she decides she's spared any further embarrassment in the matter and hustles the inspector, together with the body, out of the house. In their stead, her son and daughter, Devereux ("Blotto") and Honoria ("Twinks"), take up the task of determining the identity of both the victim and his killer. Blotto, Twinks, and the Ex-King's Daughter is a delightfully entertaining spin on the traditional English manor house murder mystery. Nearly every aspect of the characters, from their names to their mannerisms, is over-the-top yet done so in an affectionate way. Of the two amateur sleuths, Blotto is described as being impossibly handsome and not prone to deep thoughts, but he's also disarmingly charming. On the other hand, Twinks knows she's smarter than everyone around her, but she never comes off as arrogant or pretentious. The droll, at times slapstick, scenes, of which there are plenty, are funny without being absurd and for a narrative that is brash in its storytelling and relentless in its pacing, there's a surprising amount of subtle humor. As to that body in the library? The book is set in the 1920s, and the plot includes references to the political unrest at the time in Continental Europe. Suffice it to say that political intrigue and royal romance are the backstory to Blotto and Twinks investigation of murder and other crimes of passion involving the royalty of Mitteleuropa. Blotto, Twinks, and the Ex-King's Daughter was originally published in the UK in 2009, with — as of the date of this review — two additional books featuring the siblings having been written since then. Readers in the US will no doubt be anxious to learn when the next in this most promising series will be published here. Acknowledgment: Maryglenn McCombs Book Publicity provided a copy of Blotto, Twinks, and the Ex-King's Daughter for this review.